Stechelberg is a small village in the glacier carved Lauterbrunnen valley of the Bernese Oberland in Switzerland, sitting at the base of the Jungfrau mountain. The village is connected by the Luftseilbahn Stechelberg-Mürren-Schilthorn (LSMS), an aerial tramway, to the car-free skiing and hiking villages of Gimmelwald, Mürren and the Schilthorn, and over on the other side of the valley above the cliffs sits the car free village and resort of Wengen. The village is surrounded by steep mountains, cliffs, and waterfalls, and is separated from the canton Wallis to the south by a line of jagged peaks and glaciers. It is on the northern entrance to a UNESCO World Heritage site, the Jungfrau-Aletsch Protected Area, with the longest glacier in the Alps, as well as high jagged peaks, cliffs and crags, alpine forest and meadows, and plentiful waterfalls and flowers. The Alpenhof, formerly a naturfreundehaus (nature friends house) sits here in Stechelberg near the entrance to the park and is still running as a Bed & Breakfast, open all year round. There are 72 waterfalls in the immediate region and they are especially impressive after a heavy rain, and the highest waterfall in Switzerland, Staubbach Falls, (300m)(1000 ft) is located in the valley. Stechelberg is accessed by Lauterbrunnen from the terminal train station, or a small road up the valley, and the only other way, in all other directions, excepting by helicopter, is to hike there over sheer steep terrain. 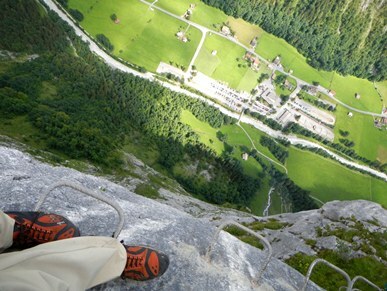 The location of the hotel is also the start of several hiking trails like the famous “James Bond 007 Schilthorn climb”. The climb to the Obersteinberg Hotel is also very nice. Sleeping in the Obersteinberg hotel is a holiday amidst nature, the mountains and wild game. You’ll find candelight and gas lamps, local specialities, a working dairy farm and mule transport of goods.